Since 1996, ING Direct has grown from a mere concept to a global enterprise, with over 20 million customers in nine countries. In an industry dominated by big banks with little patience for their customers, ING Direct has always strived to be different - a rebel with a cause, if you will - and in doing so, they've become the most successful online banking venture in history. 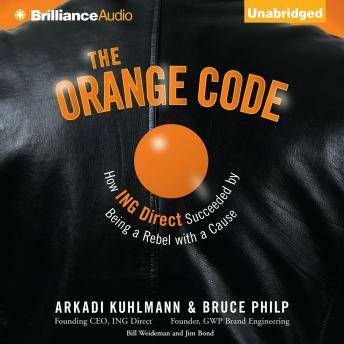 The Orange Code recounts ING Direct's intriguing story, explaining the philosophy of its founder Arkadi Kuhlmann - who believes in the power of individuals to control their financial destiny - and his long-running partnership with Bruce Philp, the branding consultant who helped him make ING Direct a cause to its own people and a household name across North America. Kuhlmann and Philp discuss their unconventional approach to business strategy, leadership, and management that built ING Direct. They not only address the practical principles that have propelled ING Direct to the top, but they also help you understand how the cause of personal financial empowerment has made everyone a winner in the ING Direct story. While the idea of a business as a cause - with a brand as its constitution - might seem idealistic and even naÃ¯ve in theory, it's not anymore. The level of success achieved by ING Direct holds some important lessons and offers some much-needed inspiration to a business world that could use a little of both right now.